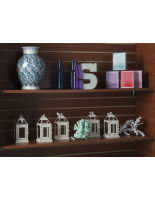 Widely recognized as the most flexible shopfitting displays available, cherry slatwall fixtures provide retailers with attractive and user-friendly designs on which to display and store products. Each panel features evenly-spaced grooves routed through the core substrate that accept most standard hanging accessories such as faceouts, waterfall hooks, shelving, baskets, and bins. 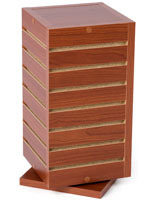 But it's the sheer flexibility that makes our cherry slatwall fixtures shine. 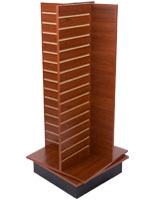 Merchandise like clothing and toys is elevated at just the right height for customers to inspect or preview. 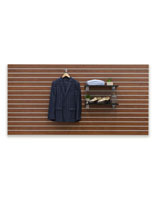 In addition, slatwall is treated like a blank canvas; able to change configurations and layouts that help keep your store's inventory looking fresh and new. So what are your options? 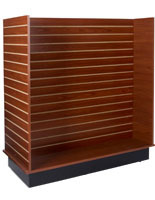 You can choose slatwall panels that mount to the wall or opt for free-standing fixtures that sit out on the sales floor. 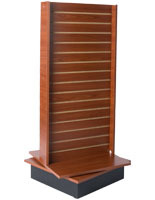 To be honest, many retailers purchase both styles in order to maximize their display capacity. 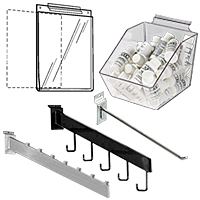 Racks such as spinners and gondolas let you display products on all sides, offering shoppers anything from small bulk items to hanging blister packs. 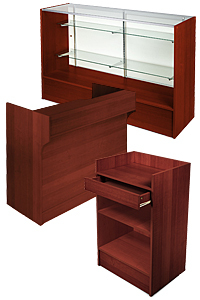 There is even a model designed for counters that's a great choice for displaying keychains, bracelets, and other trinkets commonly seen in souvenir shops. 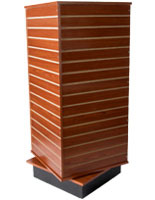 When strategically placed near checkout counters and cash registers, these fixtures help spur impulse buys. 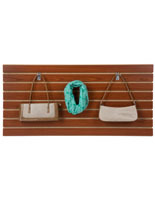 Our collection of cherry laminate slatwall fixtures offer the warmth of real wood yet in a durable and scratch-resistant surface, designed to last for years of merchandising service.